NEVER TAN WITHOUT A LOTION! Using a tanning lotion is an essential element to achieving the deepest, darkest, longest lasting tan possible. The tanning lotions that we carry also have an immense amount of skin care ingredients. Did you know that UV light bounces off of dry skin? It takes 6-7 minutes for UV light to penetrate dry skin and only 30 seconds to penetrate moist skin. Moisturized skin,tans better and keeps your tan longer. If you are not using a tanning lotion, you are only getting 30% of your tan! We have the largest lotion display in the area so you can find the perfect lotion for your individual needs. If you ever have any questions, please email us or ask a salon associate. Using a high quality tanning lotion designed for your skin and your tanning goals is a crucial element of the tanning experience.Did you know? You loose 3 to 8 minutes of your indoor tanning time when you do not use an indoor tanning lotion. Lotion will stimulate your melanin, giving you maximum results! Lotion will keep your skin moisturized and extend your tan! Packets are enough lotion to cover the entire body for a 1 time application. If you are using a packet more than 1 time,you are NOT using enough lotion for your tanning session.Packets are a good way to find your perfect lotion. Once you find that one you love, it is more cost effective to buy a bottle. Bronzers are often added to tanning products to enhance and darken the tan, blend unevenly tanned areas, and enrich the color of the tan. Bronzers work to give you a “HEALTHY GLOW” when used daily. Streaking is virtually unheard of because the effects are gradual. This concept is extremely popular. 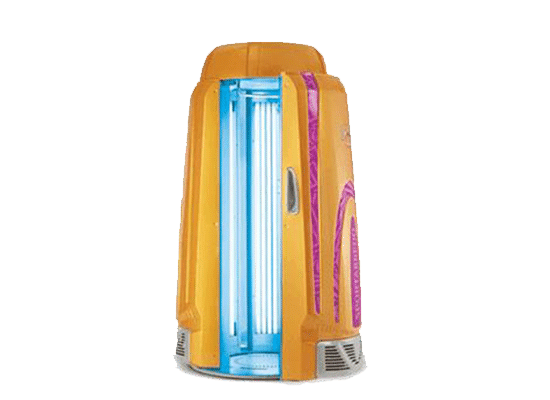 These are effective for people who tan indoors, outdoors, or don’t get any UV exposure at all. An intensifier/accelerator lotion is a lotion that has ingredients in it that will hydrate and tan your skin. There are no bronzers in this type of lotion. It has ingredients that work with the melanin in your skin. You will only see the color that your melanin produces. There will be no bronzers to darken your tan while your tan develops naturally. Tingle lotions contain ingredients which cause micro-circulation. Micro-circulation brings blood to the surface of the skin. When the oxygen in your blood rises to the surface of the skin, the UV light can reach it much more easily. This process will deepen your tan to a new level. When using a tingle lotion, you may experience any or all of the following that may last approximately one hour, although these effects may last longer based on your skin type: Mild to intense tingling of the skin Slight to intense reddening of the skin Mild to intense heat on the surface of the skin. You should NEVER use a tingle lotion on your face. The skin is much too thin and this could result in the popping of a capillary. If you want to lessen the tingle feeling of the lotion, mix it with an accelerator or bronzer. You will have an amazingly dark tan because it will push you beyond your tanning plateau. Tan extenders are moisturizers used for after tanning & will extend the life of your tan dramatically. Moisturizing your skin with a tan extender is one of the most important things you can do to maintain your glow. FACT: You do not tan on Dry skin. Stay moisturized! FACT: Tan extenders have special ingredients that over the counter moisturizers do not have. FACT: Tan extenders also help lock in your color & extend the life of your tan.